Fall 2018 Project Update – Continued! Last month, we updated you on five projects that were on the horizon. As the year comes to a close, we would like to introduce a few more and update you on some we’ve already introduced. VFW #8483 Truax-Longmire (Madison). 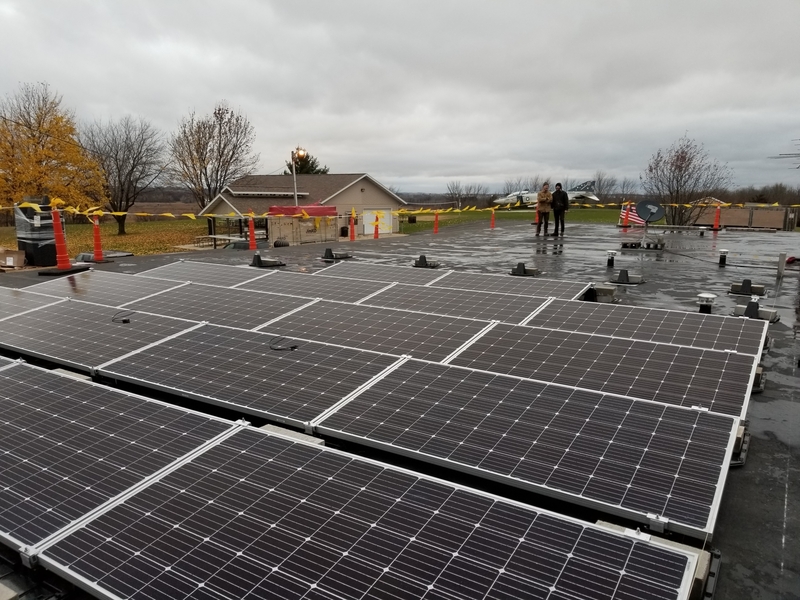 During the week of 11/5/18, Member Midwest Solar Power of Madison added panels to the VFW roof in the beginning of the month! 40 kilowatts of solar thanks to bondholders, RECIP and Solar 4 Good grants. Oregon Ice Arena. LSC Member Full Spectrum Solar will be installing 190 kilowatts on the pitched roof facing due south just east of Highway 14 and just south of the High School in the city of Oregon. On Ice Promotions worked with the non-profit’s board and got this big project the green light after first being introduced to the ice arena 2 years ago. The project will generate about 20% of the ice arena’s electricity use and its 560 flush mounted solar panels help keep the inside of the ice arena’s roof nice and cool during the hot summer months making the solar power even more attractive. Christ Lutheran Church in Spring Green is about to get 54 solar panels installed by Member WES Engineering on the roof covering their fellowship hall. This project should generate roughly 60% of the church’s electricity and set a great example of environmental stewardship for the community and for other congregations. A Solar for Good grant was used to help bring the cost down for the Church. The Literacy Network of Dane County in Madison will also get 20 kilowatts of solar on its roof just off of South Park street. Thanks in part to a Solar for Good grant and a Legacy Solar Co-op loan, this end-of-the-year project we hope can be installed and commissioned before Christmas. Thanks to the hard work by Member WES Engineering. Thank you all for your membership, your readership, and your investments in your Co-op this year. Drop us a line some time — or, better yet, come by the Goodman Center for our Annual Membership Meeting. If you are not yet a member, we can help you with that situation. https://legacysolarcoop.org/wp-content/uploads/2018/10/Update-From-Kurt3.jpg 351 500 Peter Fiala https://legacysolarcoop.org/wp-content/uploads/2016/09/logo-banner4.png Peter Fiala2018-11-14 22:27:172018-11-27 23:22:40Fall 2018 Project Update - Continued!